at different locations. 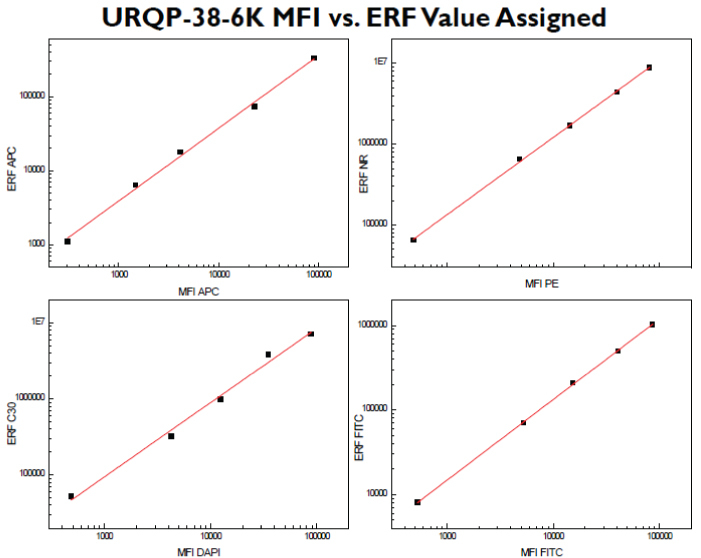 In addition, the URQP can be used for routine calibration of flow cytometers. By using these particles, the sensitivity, linearity, and component performance of the system can be determined. The sensitivity of the instrument will help detect any dye or light contamination. The URQP is used to check the instrument's ability to distinguish dim peaks from blank beads. In addition, the URQP can aid in the measurement of the linearity of the instrument to determine if the logarithmic amps and PMTs are functioning properly. Finally, the URQP can be used to detect laser fluctuations, failed electronics, or obstructions in the flow cell. - Used during flow cytometry standardardization and calibration measurements for the further advancement of biological and clinical applications.